I’ve now been working in the industry for around 47 years! 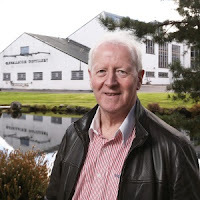 Acquiring the BenRiach, GlenDronach and Glenglassaugh distilleries was stellar, but being given the opportunity to acquire GlenAllachie and sculpt our own canvas is so amazing. I certainly can. My first dram was a Ballentine’s, which was and still is in the champions league of blended Scotch whisky. Scotch whisky is an absolute passion and being in the position to craft brands has been such a privilege. Still blending and still alive! My last dram was a trial sample of the new 12 Year Old GlenAllachie, which will be launch later this year. It’s quite simply stunning! My favourite has to be a single malt with venison. Any time after 6pm and in any location. Confusing my aspirations with reality, I hope the GlenAllachie range of single malts, which will have all the hallmarks of quality. The next gentlemen’s measure of the GlenAllachie 1978 sherry cask, part of the 50th anniversary single cask releases. Many thanks to Billy Walker. Who will be our next Whisky Insider? Click back soon to find out!